Producer: Malopoets & Martin Meissonnier. Mixed By: Stephen Street at the Fallout Shelter (Island, London). 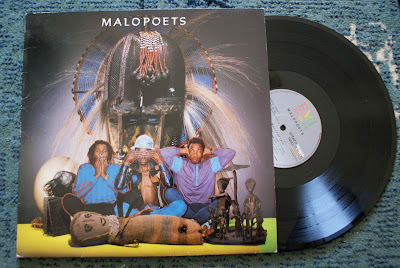 The Malopoets were another talented act whose success was curtailed by apartheid. 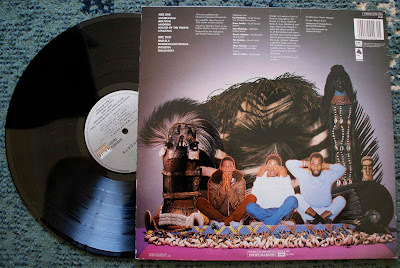 Recorded in France and published by EMI, their self-titled 1985 album was their international debut, following their 1982 debut Fire on the South African label MINC, and came the same year the band featured on the popular international collaboration Sun City. Subsequent releases included Life is For Living (1988) and the 1989 single on Virgin, The End Is Near. Personnel consisted of Pat Sefolosha (lead vocals/sax/congas/ percussion), Bruce Sosibo (lead vocals/drums), Sam Shabalala (rhythm guitar/vocals), Kenny Mathaba (lead & steel guitar) and Pat Mokoka (bass/vocals), Moss Manaka (percussion/Rap), here featuring fellow exile Mervyn Africa on keyboard.